Many animals have the ability to remember. Rats, for instance, can be taught to follow a maze in what scientists would describe as pattern or rote memory. Only man was given the divine gift of logic to analyze memories of the past in order to make decisions about the future . . . The history of man, however, is littered with lessons ignored, usually with disastrous results. Exodus Chapter 1, Verse 8, “Now there arose up a new king over Egypt, which knew not Joseph,” illustrates for us that tyrants conveniently “forget” past contributions to society of those they wish to use as future scapegoats. Joseph’s interpretation of the “old” pharaoh’s dream saved the entire Egyptian nation from starvation, a fact ignored when the “new” pharaoh enslaved the Jews living peacefully in his nation. Similarly, Adolph Hitler instituted the Holocaust against a Jewish population that was a well-integrated minority in Germany and constituted a significant proportion of the educated and professional segment of German society. The Bible also teaches us that Good and Evil are absolutes – and that God expects us to understand the difference and act accordingly. Throughout history, ignoring this basic lesson has led to the downfall of individuals and nations over and over again. Evil cannot be ignored, accepted, or appeased. It must be confronted and conquered. The perpetrators of the Holocaust attempted to explain away their immoral acts by claiming “I was only following orders”, but this excuse was rightly rejected by the Nuremberg tribunal. We are not required to obey laws, orders, rules, and regulations that are in direct contradiction to God’s law which we should all know and accept as the moral basis for moral government. Obviously, when we challenge our rulers on this basis, we risk retribution and must be prepared to accept their wrath. Failure to do so, however, makes us ultimately subject to God’s final judgement, which will be far more severe and eternal. The founders of our nation were inspired by God to create a government that was responsive to and based on the morality and sovereignty of individual citizens of sovereign states. Our Constitution was a contract among the 13 sovereign states, creating a federal entity with limited and enumerated powers. As the contractors, the states retained all powers not delegated to the federal government. The federal government, as it was the creation of the sovereign states, was most assuredly not a party to the agreement. Our founders gave us three tools to enforce the contract: nullification, interposition, and secession. Nullification is constitutional but complicated by politicians and their self-serving agendas. Secession is also constitutional, but it has been tried, and it failed. Interposition remains the most useful and potentially powerful tool available to us as individuals and local governments to control and restrain a federal government, its elected officials, and its bureaucrats whose lust for power knows no bounds. Growing up, I did not have an older brother, but many of my friends did. It was the older brother’s duty to protect his younger siblings from bullies on the playground. In fact, this obligation was often demanded of him by his parents, who expected it to be fulfilled without question. This is the essence of interposition, and it defines the role and obligation of a Lesser Magistrate. Most of us recognize that our federal government has grown well beyond the limits originally placed on it by the Constitution. The 16th Amendment (Federal Income Tax), the 17th Amendment (direct election of senators), and the Federal Reserve Bank, all clearly contrary to the documented intent of our founders, destroyed state sovereignty and diminished a state’s ability to resist federal overreach. Progressives of both parties used these tools to create a class of dependent persons, the “recipient class,” most of whom are loyal to government based on its continued largesse and have neither the desire nor the will to escape dependent status. The “recipient class” continues to grow, ensuring the continued existence of the one-party oligarchy that controls the federal government and steals the fruits of the labor of the minority “provider class.” As the oligarchy legislates more power and wealth to itself with the support of its purchased votes, the ever-shrinking “provider class” is progressively enslaved. Moreover, our nation has turned away from the moral traditions and guidelines of our founders. As a nation and as a people, we have abandoned the boundaries that separate good from evil, and we now operate within the amorphousness of moral relativity. Most believe that this spiral of dependency, national debt, and immorality is fatal and terminal and that no possible solution exists at the national level. Enter the Lesser Magistrates, our “big brother,” whose absolute obligation is to stand in the gap between We the Oppressed and our Oppressors in D.C. and to reestablish the rule of law and morality codified by our Constitution. It is our duty as citizens, even at risk to ourselves, to exhort and encourage them to interpose themselves as our protectors and to support them when, even at risk to themselves, they do. I recently read a book titled The Doctrine of the Lesser Magistrates by Pastor Matt Trewhella. 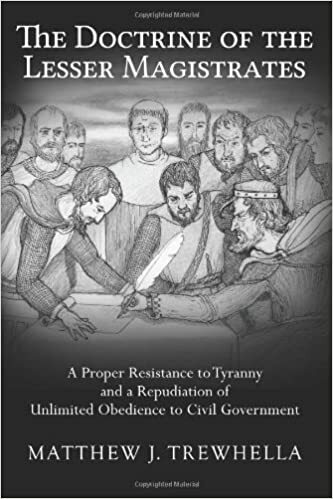 The subtitle of this book says it all: A Proper Resistance to Tyranny and a Repudiation of Unlimited Obedience to Civil Government. After you listen to my interview with Pastor Matt, I urge you to read this insightful and compelling book. Dr. Dan’s guest on Freedom Forum Radio this weekend is Pastor Matt Trewhella, noted author and pastor of Mercy Seat Christian Church in the Milwaukee, Wisconsin area and founder of Missionaries to the Preborn. Dr. Dan and Pastor Trewhella will discuss the law of God as the objective standard by which men determined whether the laws of men were just or unjust, moral or immoral and the Doctrine of the Lesser Magistrates and interposition. Through his research and teaching on the biblical duties of the lower magistrate, Pastor Trewhella came across the Magdeburg Confession, an important historical work that became the first in the history of mankind to set forth in a doctrinal format what only later came to be known as the Lesser Magistrate Doctrine. Pastor Trewhella and his wife Clara live in Milwaukee, Wisconsin. They have eleven children. Part one of this three-part interview airs this weekend, Saturday and Sunday, September 26-27, on WJRB 95.1 FM and streamed live over the Internet. Part two airs October 3-4 , and part three airs October 10-11. All programs are available by podcast following air time here. Precisely. The concept of the “constitutional sheriff” (Richard Mack) fits in with this doctrine of the lesser magistrate. That is how we avoid lawless mobs – when a duly elected Sheriff is leading the Resistance. If people would put the effort into getting a good Sheriff instead of wasting their time on the worthless contenders for the R nomination for President, we would be better off. Pastor Matt visited Blairsville, GA courtesy of Joshua’s Warriors about a month ago to give a presentation on “The Doctrine of the Lesser Magistrates”. I was very pleasantly surprised to see that his message was not just another rant about the decline of American government and American culture. Pastor Matt actually puts forward a viable, legal solution to America’s current woes. He is well worth your time to listen to; and his book is well worth the read. Its long past time the GOP dropped LINCOLN out of the Lincoln-Reagan Dinners.